There once was a kid from North Carolina who grew up to be a rock ‘n roll star. Such is the story of Ryan Adams, but as many in the local music scene know, there’s much more to it than that. David Menconi, local music critic extraordinaire, is perhaps the one perfect person to tell that story, and he has done so splendidly in Ryan Adams: Losering, a Story of Whiskeytown. 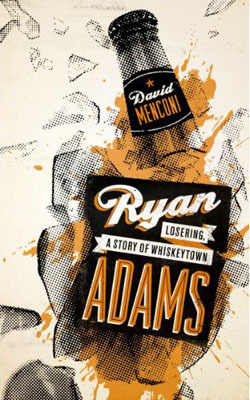 While this is indeed an unauthorized biography – Adams did not agree to be interviewed for the book – it helps that Menconi was essentially riding in the sidecar for much of Whiskeytown's rise to prominence. Menconi's extensive history of interviews with Adams and other key players in the Whiskeytown story proved invaluable, as he discusses on his blog. For the reader, turning the pages of Losering is like hopping in a time machine. As someone who’s lived in the area since the mid-90s but was too young to take part in the scene until the post-Whiskeytown era, the names and places are familiar, but the stories are mostly new, leaving a fuzzy dreamlike glow around the whole thing. Menconi writes as a fly on the wall (and at times a prominent character himself) following the highs and lows from Adams’ beginnings as a punk rock teen in Jacksonville to the rise of Whiskeytown and then his prolific solo career. A quick but satisfying read, Losering is surprisingly full of chuckles and should certainly be on the must-read list of Ryan Adams fans and those with an interest in the Triangle music scene. The only thing that would make the book more complete is a biographical index to remind the reader who's who. Menconi will hold a reading and book signing at Quail Ridge Books in Raleigh on Thursday, September 27, at 7:30 p.m.